People love watching funny cat videos, even when they have to gather in person. OK, guys. I get it. I really do. The internet likes cat videos. At first, I hoped it was kind of a passing fad: something that we dog-lovers could roll our eyes at and wait out. If the first official Cat Video Festival is any indication, though, the internet's collective feline fascination isn't going anywhere. 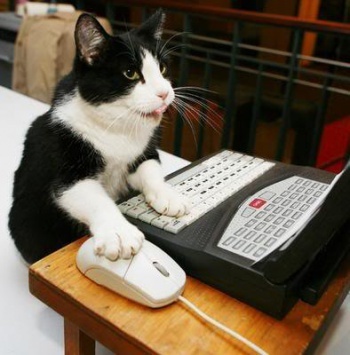 On August 30, 2012, over 10,000 cat ladies and gentlemen gathered at the Walker Art Museum to sample some of the finest kitty videos available online in ten different categories. The Walker Art Center in Minneapolis, Minnesota and its gargantuan lawn are no strangers to outdoor events, although it has probably never hosted anything quite like the Cat Video Festival before. In front of a crowd of thousands, the center screened dozens of carefully culled videos from categories including Comedy, Foreign, Animated, Musical, and Art House, and handed out awards ranging from People's Choice to Lifetime Achievement (leaving aside how a first-ever event could award such a thing). Some of the entries that made the final cut included "Slow Motion Kitten," "Dubstep Cat," and, fittingly, "The Internet is Made of Cats." Ultimately, cat enthusiast William Brandon took home the coveted Golden Kitty award for his existential French drama, "Henri 2, Paw de Deux." More than anything else, the Cat Video Festival is a demonstration of the power and ubiquity of internet culture. An exhibition that, by all rights, should not work, ended up drawing a bigger crowd to an art museum in one night than it would likely see in a week. The event's success almost guarantees a second Cat Video Festival, so all of you cat people out there can keep your eyes peeled and claws sharpened for that one. I'm going to sit on a stoop with a dog while we make funny faces at each other. Maybe someone will turn it into a video.